Undocumented Mother: Stop Separation of Migrant Children by Dropping Charges Against Their Parents | Democracy Now! an undocumented immigrant and mother with the group Mijente and Northwest Detention Center Resistance. For more, we’re going north, from the southern U.S. border to Seattle, Washington, where we’re joined by Maru Mora Villalpando, an activist and undocumented immigrant with the group Northwest Detention Center Resistance and the group Mijente. She has a hearing in her own immigration case on Tuesday. Also, well over a hundred people have been taken from the border in the last few weeks and brought to a federal prison in Seattle. Maru, welcome back to Democracy Now! Can you talk about the connection between Washington state and the U.S.-Mexico border? 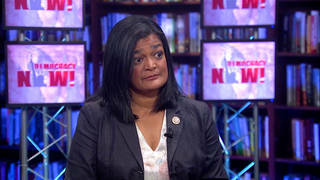 AMY GOODMAN: This weekend, Congressmember Jayapal returned to the SeaTac detention center to meet with men who are jailed there. Outside the facility, after her visit, she said, “The president is the one who created this crisis. He’s the one who can end it by picking up the phone and calling Jeff Sessions and ending this 'zero tolerance' policy.” Maru, talk about your own case, because as all of the focus now is on these thousands of children who don’t know if they’ll ever see their parents again, you also have immigrants around the country, like yourself, also a mom, who face deportation. And in my case, I think it’s very clear that ICE jumped from an agency that was created to destroy my community, to try to get rid of us whatever way they can, and make money on the way, to actually become a political repression machine. So, I’m not the only activist being placed in deportation proceedings, but my case is very clear. They have nothing on me. I have no criminal record. I have never been in a raid. And still ICE decided to begin deportation proceedings against me. And as they clearly marked on a document that they sent to the judge, they see me as an anti-ICE activist. And they even dared to say that I’m a Latino advocacy activist, too, which I didn’t know it was grounds for deportation. ALEXANDRIA OCASIO-CORTEZ: And you have said it’s fascist. Then why don’t you adopt the stance to eliminate it? This is a moral problem. And your response has been to apply more paperwork to this situation, to have ICE collect more information on immigrants. And that puts our communities in danger. And it also conveys a profound misunderstanding of how we should be approaching this problem. MARU MORA VILLALPANDO: Well, there’s too many players nowadays. We notice here in Tacoma, Washington, one of the biggest corporations of private prisons, GEO Group, being one of the biggest profiteers right now. But there are so many companies within that system. We have Keefe, the commissary company. We have Telmate running the communications. We have Aramark bringing, quote-unquote, “food” to the detention center. But now we’ve also seen the expansion of detention to county jails. So, for example, people in Tacoma are being transferred to NORCOR, a county jail in Oregon, where they’re also getting more money because they’re accepting money from ICE, supposedly to be able to run the jail. We’ve also seen, as the example of the southern border, “nonprofits,” quote-unquote, also making money out of the misery of these children and their parents being separated. AMY GOODMAN: The issue of Microsoft, which is based where you are, in Washington state, facing threats of a boycott over its collaboration with ICE. A blog post from January resurfaced, in which Microsoft said it was “proud to support” ICE and that Microsoft’s technology can help the agency “accelerate facial recognition and identification.” In response to the online outrage and boycott threats, the company said Microsoft is “dismayed by the forcible separation of children from their families at the border.” Are you satisfied with that, Maru? This is Democracy Now! When we come back, we head south to Washington, D.C., where thousands marched and rallied on Saturday to both end the first period and inaugurate a new Poor People’s Campaign. Stay with us.